The trend over recent years to warmer autumn weather and greater extremes in winter conditions poses new challenges for turf management, especially fungicide selection. With increased turf stress and disease pressure, the objective to protect quality greens' surfaces must be to: 'go in clean, to come out green'. GreenCast historic disease and weather records show that typically half of October days will see significant rain and heavy dews almost every morning, creating increasing risk of the most damaging turf disease, Microdochium (Fusarium) Patch (Microdochium nivale), breaking out - as witnessed last year. Initial reports this season are that the Microdochium Patch pathogen has rumbled along through the relatively cool and dull summer conditions, with potential to flare up when triggered by rainfall and changes in temperature. Periods of disease pressure could see infection symptoms break out on the more susceptible turf surfaces. Early disease infection also increases the build-up of disease pathogen on leaves and in the thatch. Furthermore, as we move into winter, we know thatMicrodochium nivalecan thrive in the wet surface conditions under a blanket of snow, which if left unprotected can lead to extensive turf loss and scarring. An Integrated Turf Management (ITM) plan to alleviate the risk factors associated with Microdochium Patch attack, including appropriate nutrition and cultural practices can help to minimise the impact of disease. It will also ensure the best results from fungicide applications that will be required when the risk is high, as well as achieving faster recovery from the effects of infection. 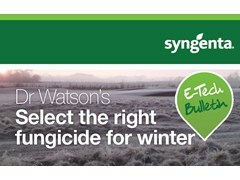 The combination of appropriate nutrition and effective fungicide selection can optimise disease control and turf health through the most difficult autumn and winter disease conditions. The key is to select the right product, at the right time. Assessing soil temperatures, using soil temperature forecasts and monitoring clipping yield from cutting greens are key guides to turf growth rates and management options required. When turf is actively growing a systemic fungicide is essential. Contact+ or local penetrant fungicides applied at this time will quickly grow up the leaf and be cut off - leaving new growth at the base of the leaf exposed to infection within hours of application. Experience of recent seasons has seen the cool weather systemic, Banner Maxx, remaining the most effective product of choice whilst turf growth continued into the winter months, when traditionally turf managers would have switched to contact products. As growing conditions slow further, the Contact+, Medallion TL, will be more appropriate, to reduce the pathogen numbers in the thatch and protect the leaf through the cold weather. Adequate nutrition is essential for plant health to minimise the risk and damage from disease attacks. With the exceptional rainfall over the summer, much of the applied nutrients will have been used to support high levels of turf growth or leached out, creating a high risk of nutrient deficiencies and turf stress if growth is extended this autumn. However, turf managers must balance that against the need to avoid encouraging soft growth susceptible to disease attack. Greenmaster Liquid fertilisers give a quick uptake of nutrients, enabling nitrogen and phosphorus applications to be more effectively matched to growing conditions. Furthermore using a High K fertiliser in October has been shown to help build root reserves of carbohydrates and prepare turf plants for the rigours of winter. The low nitrogen and phosphorus in these autumn products helps maintain optimum nutrient ratio as growth slows. 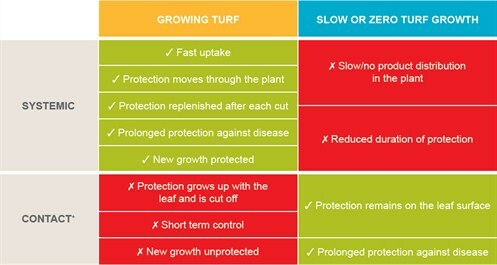 Trials have proven that the autumn and winter programme of Greenmaster Liquid fertilizer combined with Banner Maxx and Medallion TL fungicides can provide extremely effective winter-long control of damaging Microdochium Patch, along with a significant improvement in visual merit of turf throughout the winter.